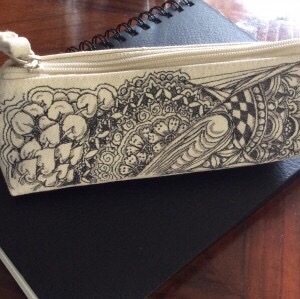 The week after returning from CZT (Certified Zentangle® Teacher) training in Providence, RI, I got brave enough to tangle two items I purchased, one a canvas portable Zentangle® tools wallet, the other a canvas pencil pouch. I had purchased all the materials I needed to complete these projects–a double-pointed Identi-pen® by Sakura®, a double-sided Fabrico® marker in cool gray, and an 8-ounce jar of Mod Podge Fabric® sealant–along with the items to be tangled, of course. I already had tons of disposable brushes, so I didn’t need to worry about application tools. But I took out one brush and set it along side the items and tools. And I let it all sit a few days. Under normal circumstances, I might have simply ditched the idea of uniquely decorating my canvas purchases and simply started using both the wallet and pouch in their natural state. Then one evening, my husband turned on a TV show in which I had no interest, it was too dark to do justice to a tile, and I just did not feel like crocheting or knitting because of the tropical stickiness, even in our air conditioned home. So I picked up the wallet and studied it. And an idea came into my head for a design. I picked up the gray Fabrico, and with the pointy marker side drew an initials string on one side of the wallet. Next, I picked up the Identi-pen and started to tangle without a thought to what I was drawing. Hmmm… Not perfect, but not bad, either! Next, I followed the same procedure on the second side, but with a more traditional string. I actually like this side better. 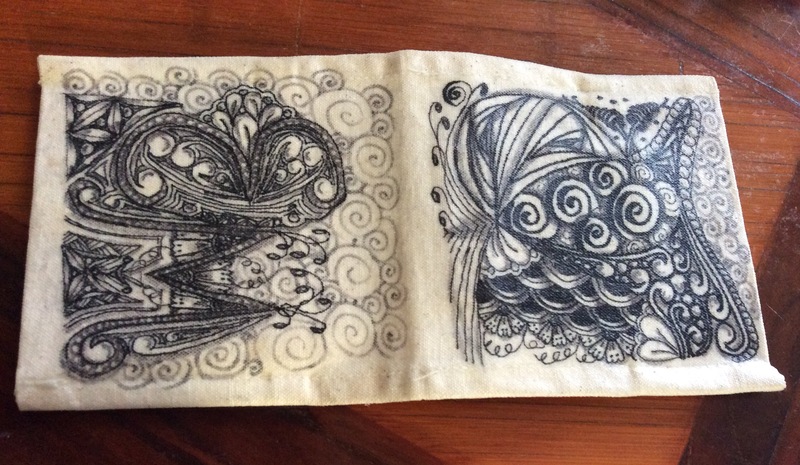 You may not be able to tell, but I then used the brush tip from the Fabrico to shade both sides of my tangle wallet. 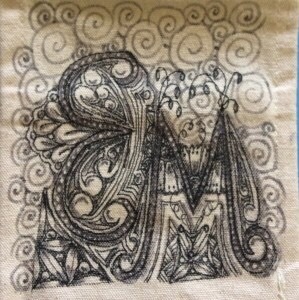 I also used the marker end to add lighter Printemps to the background of the initialed side as well as the other side. My husband–who never notices anything that isn’t purple–glanced at what I was doing and complimented my work. This is a first–ever! He generally has no idea what I am dong. For the final step, I had to leave the room and open alll the windows and door in the kitchen–yes, it was Mod Podge time! Although the canvas doesn’t really need protection as the color is completely colorfast, I was afraid I might accidentally scrub off or otherwise mess up the designs just by using it like I use all my tool bags–roughly. To protect my little masterpiece from normal wear-and-tear, I decided to seal and protect my work so I could just wipe the surface if I picked it up with graphite-, ink-, or pastel-stained fingers. The cool air may have been flowing out the kitchen portals, but I didn’t want to get dizzy. I suspect I have enough brain damage without adding more. Thus, the open windows and door, and the dread of an outrageous electric bill. I covered the counter work space with parchment paper (wax paper works just as well, but parchment came to hand first). 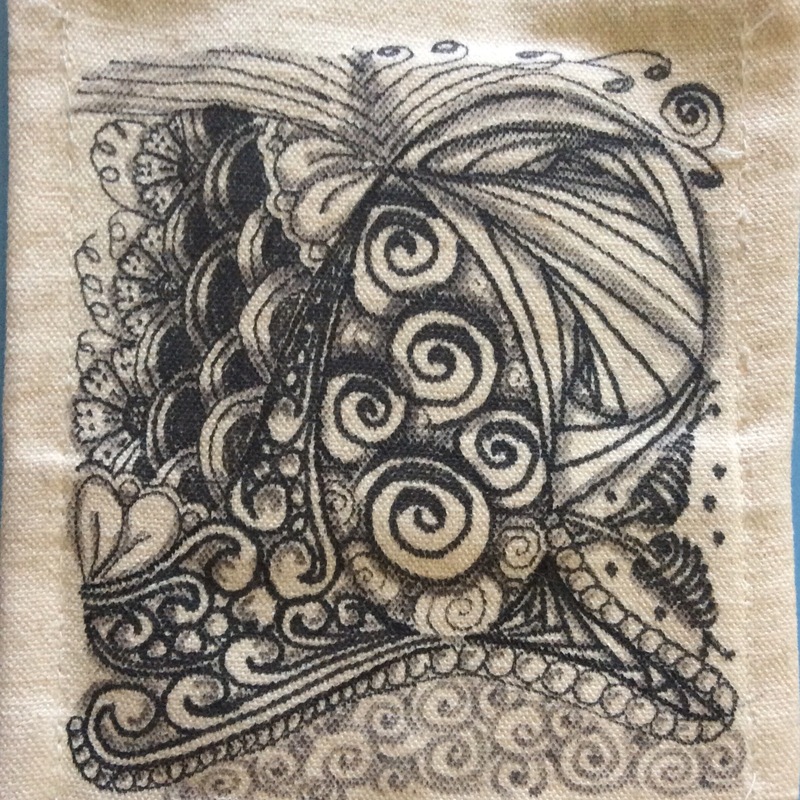 I placed my disposable brush and the opened up wallet on the paper, and finally opened the Mod Pdge Fabric jar. The sealant doesn’t smell as bad as some, but worse than others. What we sacrifice for our art! Stirring the goop with a wooden coffee stirrer, I figured it was a decent consistency to paint onto my work. Holding my breathe more from fear than aversion, I dipped the foam brush into the jar, let it “fill up” with the goop, and finally applied it to my work. It was much thicker than Elmer’s School Glue, but it was workable. Starting with the stitching, I really pressed the Mod Podge into the machine-sewn depressions. Next I painted the edges. 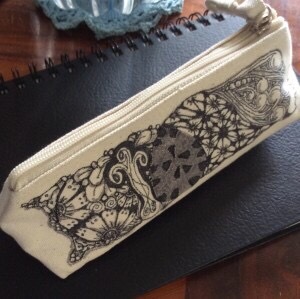 Finally, I painted the opened out decorated side(s) of the wallet–realizing for the first time that I could have tangled the whole thing end to end instead of one side, then the other. Ah, well. Next time. But back to painting on the sealer–I brushed lengthwise, then side to side, then across one diagonal, and finally across the other diagonal. The whole time I made sure I was working the glue-like substance as deeply between the threads of the weave as possible. Finally, I moved the wallet to a clean section of parchment to let it dry. The following night, the Mod Podge was very dry to the touch. So I figured a second coat was needed. This time, I poured a little Mod Podge into a disposable cup and added just a drop of water–just enough to thin the consistency to a little thicker than Elmer’s Glue®. The second application was easier to apply, but it took longer to dry–about half a day longer. Two days later, I added a third and final coat. It took days to stop feeling tacky. Decided the third coat was overkill. Here s the wallet opened up. See what I mean about how I could have done one complete tangle instead of two? Oh, well. 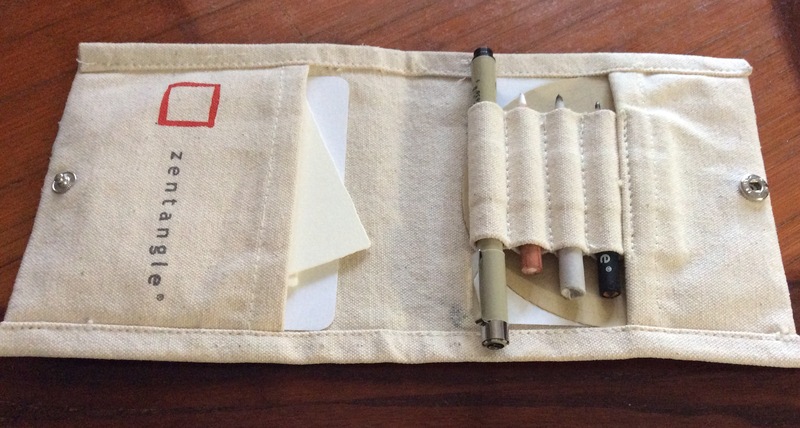 Having learned from my first project, I tangled my second project next–the pencil case. I did everything the same way except that I skipped the third coat of sealer. One quick word of advice if you are going to try a similar project: wash the canvas or cloth item first, then press the cloth and (if you can) the canvas item. Cloth manufacturers put sizing and other stuff into cloth when they make it so it works better with the weaving and dying machines. This can interfere with sealing your item. But wash by hand, or on the delicate washing machine cycle. I haven’t been able to find my iron in the year since we moved to this home. It’s probably in one of the many unpacked boxes I have. As you can tell, I don’t iron much and only miss the appliance when I need it for a project. Lost iron is also why I have done no quilting in a year. But who needs an iron when I have tangling? If you want to share your tangled creations here on my blog, just leave me a message under comments! This is awesome Ellie! Thanks for sharing your process! This was just tons of fun to do! I am considering buying mor and tangling them, too!